Progress on CC-Series development proceeds at a reasonably-good clip right now. One of my last big hardware bugs to stamp out is some nasty microphonics that seem to be generated by the combination product detector/BFO. Today, I believe that I made some significant progress towards solving it and wanted to share what I learned. I’ve done a lot of reading in Experimental Methods in RF Design (EMRFD) about microphonics in DC receivers (read chapter 8! ), and the number one cause of it is poor LO-RF port isolation in the mixer. The CC-Series uses a venerable old circuit which hasn’t seen much use in a while. A dual-gate MOSFET is pressed into double-duty as a product detector and BFO (see above). 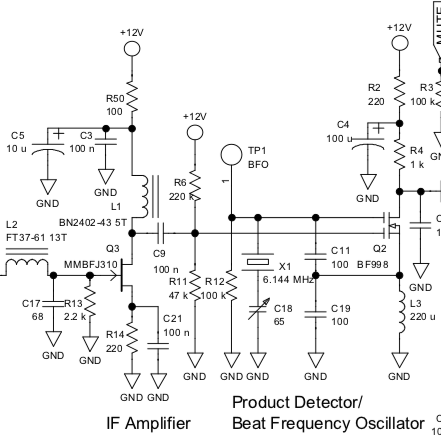 Since the dual-gate MOSFET product detector is in a single-ended configuration, it inherently has bad LO-RF isolation. This allows VFO (or BFO in this case) signal to leak out the product detector input, and have a good portion of that signal reflect back into the product detector. So naturally, the CC-20 could be experiencing the microphonics because of this phenomena. One of the solutions mentioned in EMRFD is to put an amp in front of the mixer which has excellent reverse isolation (signals coming into the amp output don’t tend to get out of the input, and therefore can’t reflect back in again). I had the suspicion that the common-source JFET amp in front of the product detector might be the culprit. So what’s the best type of amp to place in front of a single-ended mixer? The common-gate JFET amp is a good and popular choice. However, VE7BPO notes on a recently published web page that the best commonly found amp configuration for this particular parameter appears to be the cascode (see the bottom of the page). In order to test this theory, I went to work on a project that I had set aside earier: a direct conversion receiver based on the CC-Series product detector. When there was no preamp in front of it, the microphonics were unbearable. I figured that a good way to test my theory would be to put a cascode amp in front of this mixer and see how much it helped. I decided to put a dual-gate MOSFET preamp in front of it, as this is essentially a cascode amp and it fits with the dual-gate MOSFET product detector. Once the new preamp was added, the change was dramatic. The microphonics were gone. Next, I decided to be a bit more rigorous in my study and quantify the exact difference between the common-source JFET amp and the dual-gate MOSFET amp. First I breadboarded the common-source JFET amp and ran it through the test procedure in the page linked above (at 18 MHz). The results were atrocious. Only 30 dB of reverse isolation, which is worse than the worst amp listed there (the feedback amp). Next, I dug out an old dual-gate MOSFET amp I had breadboarded for my 2008 investigations and ran it through the same test. As expected, the results were vastly superior: 68 dB of reverse isolation. This lines up nicely with Todd’s measured results of >64 dB for the hybrid cascode (I used a spectrum analyzer while he used an oscilloscope, so I was able to get a pretty good measurement down to low signal levels). So this appears to be strong evidence that the IF amp is the problem. It seems certain that the next version of the CC-Series is going to scrap those awful common-source amps for a much nicer dual-gate MOSFET amp. The lesson to take away from this is that if you are going to use a single-ended mixer for any but the most simplistic applications, it must be fronted with an amplifier with an excellent reverse isolation. While the typical common-gate JFET amp will work OK, for best results it looks like a cascode or dual-gate MOSFET amp is the way to go. I remember isolating this stage with you and identifying it as the source of the problem. Really glad to hear that you’ve figured out exactly why this stage is causing the issue. I’ve slowly begun work on the enclosure for beta 2. Looking forward to it very much! A dual-gate MOSFET and a cascode amplifier built from JFETs are essentially the same thing, just as screen-grid-tetrode vacuum tube and a two triode vacuum tubes in cascode are essentially the same thing. Two BJTs can be cascoded as well. Dissimilar devices can also be used, as in Hayward and Damm’s hybrid cascode amplifier. What you get with the cascode is, among other things, very low output-to-input capacitance and practical banishment of the Miller effect compared to a triode (your common-source JFET). These achievements are why the introduction of the vacuum-tube tetrode was so revolutionary; triodes used as RF and IF amplifiers had to be neutralized to prevent self-oscillation, but tetrodes did not.